As Jordan doesn't exist as a team anymore and like you say the other 'classic' teams have already or are using their old colours, the only one I can think of is McLaren using either Marlboro red and white or orange. Last edited by minchy on Wed Jan 15, 2014 11:42 am, edited 1 time in total. Orange McLaren I think. Joe Saward heard rumour a few days ago. Does this give a clue? Merc rebranding as Tyrrell and running Alex Pesenti-Rossi Gulf Rondini livery? look further south west ! Could it be Williams adding the yellow to their blue and white livery? I am thinking with the addition of Massa to Williams and the colours of the central bank of brazil that Williams are highly likely to be reverting to the good old yellow white and blue livery of the 80's and 90's if they have this new sponsorship because of Massa. Races attended: Belgian GP 2008/10, British GP 2009/10/13, Hungarian GP 2009. Last edited by WilliamsTeam on Wed Jan 15, 2014 12:08 pm, edited 1 time in total. Good points both of you. I work for the company who produces the McLaren replica team kit, there isn’t any Orange on the 2014 range. Doesn’t mean there won’t be on the car though. The return of black wings and gold wheels on Ferraris? I agree with above posters. It must mean either Williams or McLaren. I'm going for McLaren, but don't know whether it'll be red/white or orange. I also read an ex-McLaren mechanic said he heard it would be silver. I hope it's orange McLaren. That silver and red got boring very quickly. I keep hoping every year for an orange McLaren.. I doubt it's them though.. My guess is Williams. If that is the case I hope they don't bring back this monster. 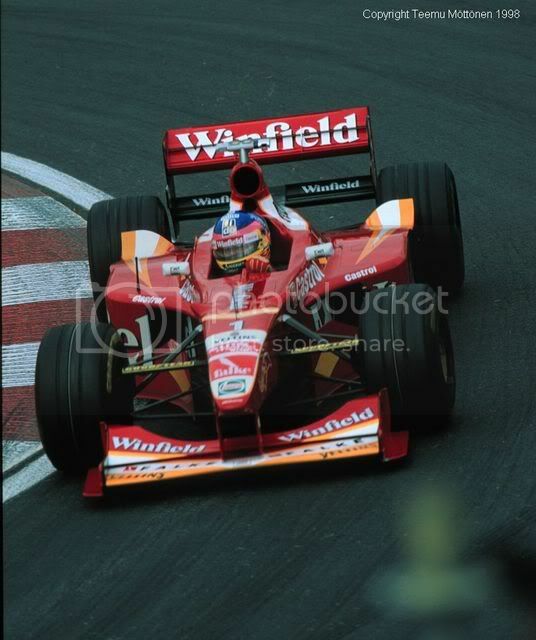 One of the ugliest liveries in the history of motorsport. There... I said it. This one - I'd heard this rumour earlier via a different forum. What sponsors are on there though? I've started to hear more and more rumours about martini sponsoring Williams this year. That would be a really special livery! McLaren are only going to be dropping most of the red. The car will remain chrome for 2014 with more black a la 2006. They might use orange for testing but that's still unlikely. McLaren are only going to be dropping most of the red. The car will remain chrome for 2014 with more black a la 2006. How do you know? Source? Logic. They won't do a major rebrand until Honda come aboard next season. There's next to no point in doing a major rebrand that'll be for one season only. Their entry for 2014 is under McLaren Mercedes so the rumours suggesting no title sponsor for this year, just like 2006, look pretty close to the truth. Not saying that you are wrong, but you sounded 100% sure, that's why I asked. And in this sport anything is possible. And about the "no sponsor for this year" = as good time as any to race in McLaren orange. I said to someone at work today that it's possible they could go orange for this season and then red and white when Honda come on board in 2015. That would please everyone I think. If they were going to go orange then they'd have put some orange on the team uniforms for 2014. There isn't any orange on them, just a lot less red much like the website. In the modern era McLaren have only used orange as a testing livery. There;s nothing to point to them using the colour as a race livery in the near future. I might be in a minority of one in this thread but, traditional or not, I can't stand McLaren orange. To be fair, I didn't like it when it first came out, and I don't like it now, so I am at least consistent. It's going to be McLaren. They've been sending out tweets of their old liveries for a while now, they've got a big shakeup with sponsorship, and they've got a new engine provider next year. Kinda makes it pretty obvious doesn't it? I mean, the only other option I can see is Williams, and given the 'neutral' state they seem to love I cant see them abandoning the boring blue and white any time soon. The big rebrand won't happen until next year. I mean didn't everyone seem to think they'd do something big livery wise for their 50th year? They didn't. McLaren are very corporate, they take branding very very seriously. They won't do two big rebrands in two years. But there will be two rebrands in two years; this year Vodafone will be replaced by [TBC] and then next year, Mercedes will be replaced by Honda, and of course it will be a closer relationship than simply engine suppliers. I'm not saying that the main colour of the car will change twice, but I don't think it's out of the question. I doubt McLaren's livery will have anything to do with the engine supplier. When Marlboro was their title sponsor, the car looked the same whether it was running Tag, Honda, Ford, Peugeot or Mercedes engines. So if their new title sponsor is coming onboard this year, then expect the livery to remain the same when Honda come along next year. ps. I also like the orange scheme - it would make sense to paint the car as they paint their roadcars. 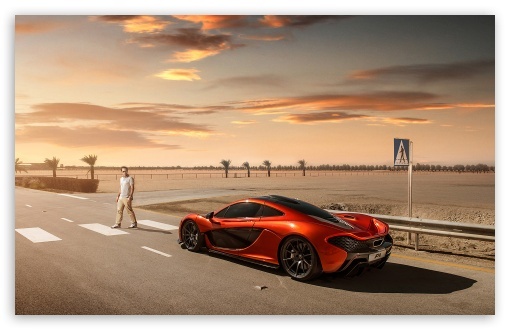 Here is the brand new P1 in its launch colour for instance. With all this talk of Mclaren having a chrome and black look - West style livery? Though that suggestion about a FW14B style Williams is a bit tasty - especially if they end up at the top end of the grid. Only Marlboro red and white on Macca would please me. Williams I would love to go for the yellow-dark blue-white livery they had when they had Canon as main sponsor. I'd say it was quite different actually. Torro Rosso to run as Minardi? Do Banco Do Brasil sponsor Massa? First I've heard of it if they do.